[Image: Der Bergbau, courtesy of the British Museum; view larger]. Der Bergbau is a beautiful 19th-century German board game set in a mine, currently in the collection of the British Museum. 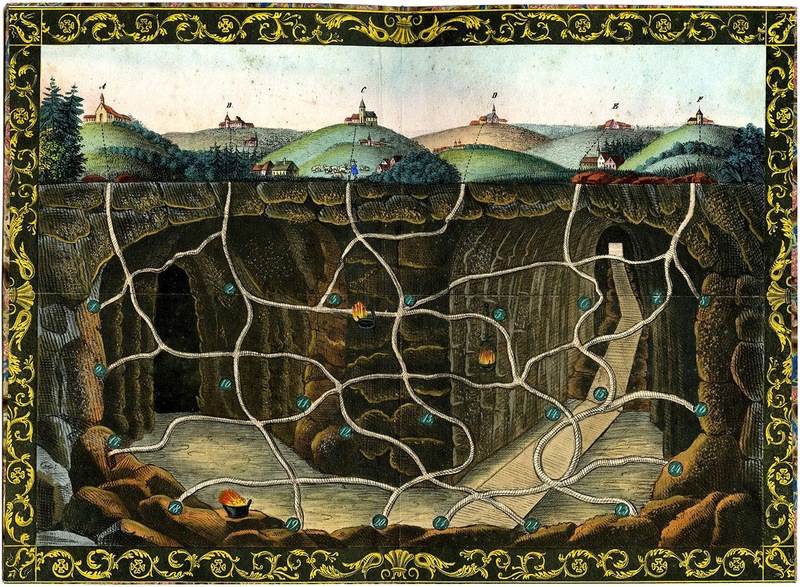 They describe it as a "game-board showing a cross-section of a mine and the network of tunnels leading down from 6 buildings, along the tunnels, various numbers which represent ore."
The rules are not given, unfortunately, but the board itself is a gorgeous image in its own right, worth viewing in full. An anonymous commenter without access to HTML formatting points out that you can see a fragment of the game's rules at the British Museum.